Gob.cl: Article: President Piñera Presents Cop 25, The World’S Most Important Conference On Climate Change, Which This Year Will Be Held In Santiago: "The Time For Action Has Arrived"
President Piñera presents COP 25, the world’s most important conference on climate change, which this year will be held in Santiago: "The time for action has arrived"
Chile will host 20,000 delegates from around the world from December 2-13 at the largest global forum to promote actions to protect the planet. The President appealed for more demanding and ambitious commitments to combat climate change. 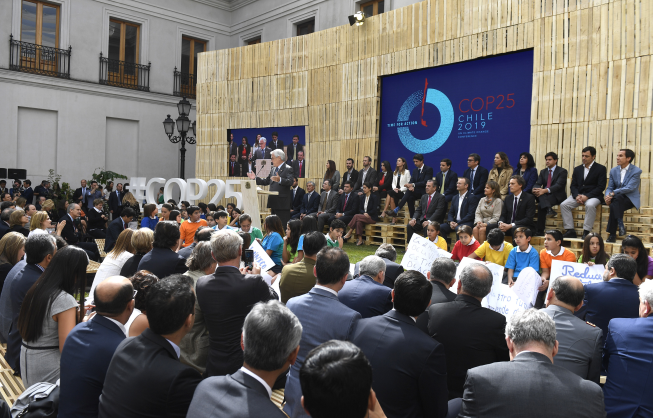 On Thursday, President Sebastián Piñera presented the COP 25 conference on climate change, which will be attended by heads of state and ministers from 196 countries, in order to promote greater actions and commitments in the care and protection of the planet. In a ceremony attended by 500 guests in the Patio de Los Cañones of La Moneda Palace, the President highlighted the leading role and responsibility of Chile as host of the conference: "It will be a great opportunity for the country and the whole world to acquire real awareness that time is running out and that every day, goals become more urgent, require more ambition and need to be more stringently enforced. For that reason, the time for action has arrived." The President emphasized Chile's progress in the fight against climate change through the development of active public policies, such as the decarbonization of the energy matrix, the boom in renewable energies, the law on environmental crimes, the elimination of plastic bags in retail outlets and the wetland protection plan. The President stressed that Chile will not open more coal-fired power plants and also underlined that the country aims for 70% of the energy matrix to be based on renewable sources by 2030. For COP 25, Chile is promoting progress with regard to the protection of the oceans, Antarctica, electromobility, renewable energies, the circular economy, and the protection of forests, ecosystems and biodiversity. "Governments need to act with much stronger conviction, and need to be much more committed to addressing this challenge," said the President, who was accompanied by Environment Minister Carolina Schmidt and the Presidential Council of COP 25, which includes the participation of former Chilean presidents Eduardo Frei and Ricardo Lagos, among others. It was announced that the conference will be hosted in the Cerrillos Bicentennial Park, while Gonzalo Muñoz Abogair, the founder of the TriCiclos recycling company, was presented as the "Champion" of COP 25, responsible for advising the Presidency of COP and for working in coordination with the United Nations. In addition, the ambassadors of COP 25 were also announced, who are public figures in charge of generating awareness among citizens about the issues that the conference will address. At the launch, the President called on all Chileans to actively participate in the conference, together with emphasizing the urgency of the changes needed to protect the planet. "The time has come when we all must join together to deal with this real tragedy," said the President.